Hollybeary Creations : You're Going Places!! 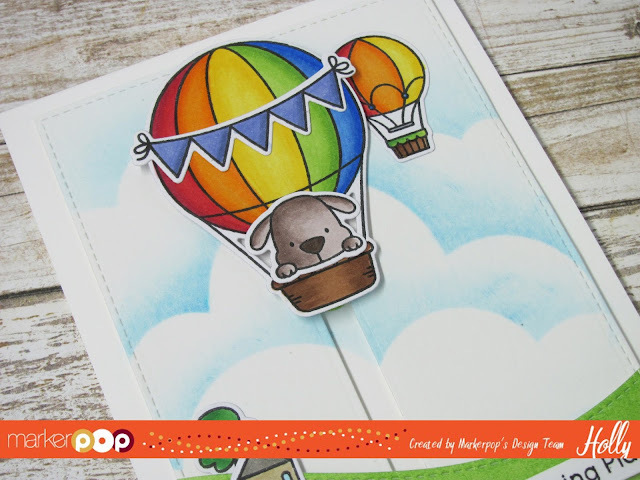 I was up on the MarkerPop Blog with a fun slider card yesterday featuring the Adorable Up in the Air set from My Favorite Things and the coordinating dies. I started by creating a White A2 size card base and then I created a cloud background using the MFT Stitched Cloud Edges to create a stencil and some Salty Ocean Distress Ink. Then I created another cloud background on a piece of White card stock that I die cut with the MFT Blueprints 29. Then I created a scene with some Mowed Lawn Distress Ink and the Stitched Snow Drifts Die-namics set. Then I die cut a channel into the panel using the MFT Slider Channel Die set. 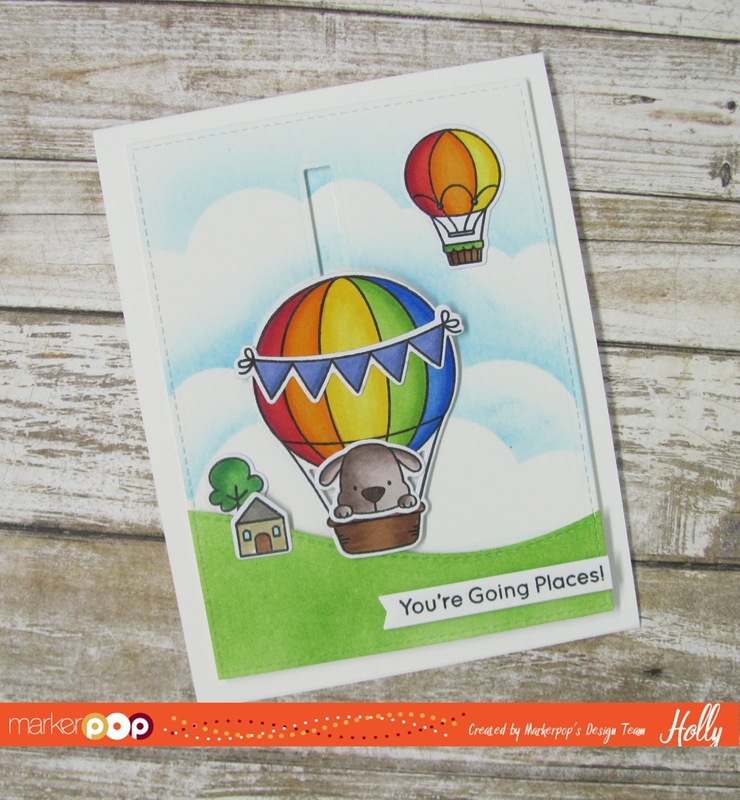 I stamped all the images using Lawn Fawn Jet Black ink onto some X-Press It Blending card stock and colored the images in with Copics. Then I used the coordinating Dies to cut them out. I adhered some of the images directly onto the scene. I created a slider for the Larger Balloon with the Channel die and the small circles from the MFT Surf & Turf Die set and three of the MFT Spin & Slide Discs. You can find many videos on YouTube on how to use these discs. Once I had the slider all set up I attached the panel to the front of the card with some foam adhesive. 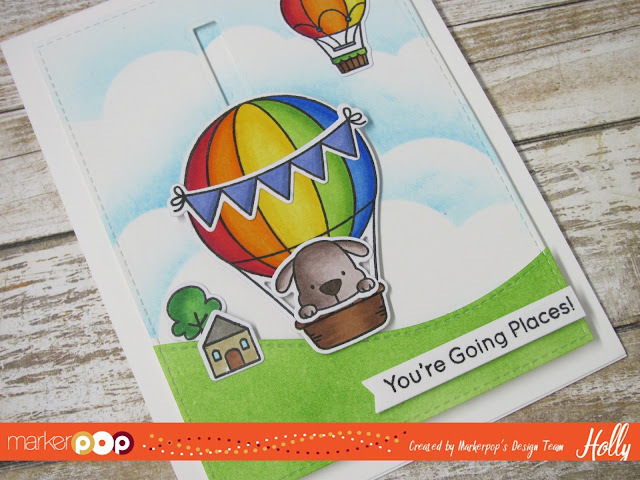 I stamped the sentiment from the same set onto a strip of White card stock and used one of the banners from the MFT Blueprints 27 using VersaFine Black ink. I adhered t with some additional foam tape as well. Don't forget to check out the MarkerPop Copic Sketch Book Giveaway!!! We have some Great prizes up for grabs.. you can find all the details in this post here.